An amendment to Myanmar’s land-ownership laws will make it nearly impossible for Rohingya refugees and Myanmar’s internally displaced to return to land they’ve tilled for generations, Peter Yeung reports. HUSSEIN AHMED WAS once the respected chief of Inn Din, a village in the northern part of Myanmar’s Rakhine state. But since the end of 2017, the 74-year-old Rohingya has been a refugee in Bangladesh’s sprawling Kutupalong refugee camp. After being forced to flee Myanmar, Rohingya refugees such as Ahmed face yet another threat to their livelihoods following a controversial amendment to Myanmar’s land-ownership law that came into effect this week. It will also affect Myanmar’s other ethnic minorities, many of whom have been displaced by decades of conflict – internally and across the border to Bangladesh, Thailand and India. In total, millions could lose access to their land. A community meeting in Myanmar receiving advice from a paralegal from Namati, a global nonprofit. 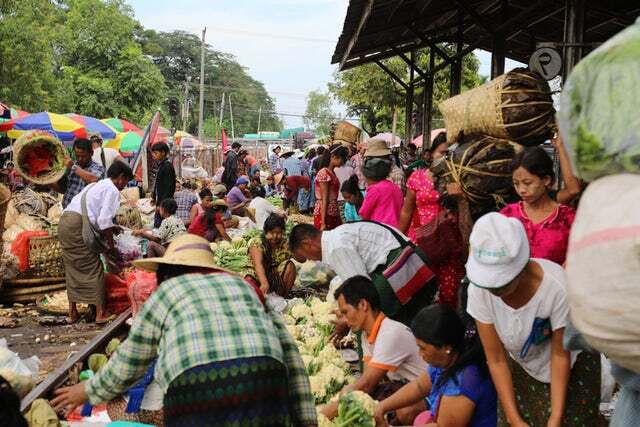 Under the amendment to Myanmar’s Vacant, Fallow and Virgin Lands Management Act (VFV), people who occupy designated VFV land – which covers 50 million acres (around 20 million hectares), one-third of the country – were last September given six months to apply for land-ownership permits. The deadline was March 11. Failure to apply for a permit may be punishable with a large fine and up to two years in jail. It also means the confiscation of land that has been passed down through families and communities for generations. Rohingya refugees and Myanmar’s other displaced ethnic minorities – such as the Kachin and Mon people, who typically originate from rural regions – could be prosecuted for trespassing if they attempt to return home. The Rohingya people have been chief among the victims of land grabs, as part of a long history of arbitrary land confiscation from Myanmar’s rural communities by the government, military and private businesses following the transition away from socialism in 1988. A government estimate in 2016 put the total amount of land illegally seized at 2 million acres (800,000 hectares). The 2012 VFV law was ostensibly meant to clarify land claims, though it’s part of a series of countrywide reforms aimed at boosting foreign investment by converting farmland for industrial use. For the Rohingya, who are described by the United Nations as the world’s most persecuted people, the amendment is yet another devastating blow. Some 720,000 Rohingya, mostly women and children, remain in Bangladesh after fleeing Myanmar’s crackdown on the minority Muslim community in August 2017. Satellite imagery shows that Myanmar officials have already bulldozed entire Rohingya villages and built new facilities and homes in their place. Under the amendment, refugees weren’t allowed to apply for permits from outside of the country – and may not even be aware of the change, according to legal experts. They could be risking their lives by entering the country to claim their land. Meanwhile, Myanmar’s internally displaced persons (IDPs) often lack the means to make an application, unable logistically to make the journey to areas where they can be lodged or to afford the journey due to their destitution. Villagers in Myanmar’s Kayin state. Even for those who successfully obtain a permit, it will be valid for only 30 years – with no guarantee that the owners will be allowed to keep the land permanently. Phil Robertson, deputy Asia director at Human Rights Watch, which published a report last July on land confiscation in Myanmar, believes the Rohingya are particularly vulnerable under the new amendment. Confiscation of land left behind by refugees or other displaced persons breaches the U.N.’s Pinheiro Principles. Government figures show that 42 percent of Rakhine state, where the majority of the Rohingya originate, is considered VFV land – one of the highest rates in the country and covering nearly 4 million acres (1.6 million hectares). Civil-society groups see the VFV law as an attempt by Myanmar to encourage business, with recent Chinese and Indian investment in Rakhine focusing on building oil and gas pipelines and infrastructure as part of China’s $1 trillion Belt and Road Initiative, a major investment program to improve trade links. The government does not dispute this, but maintains that any reclamation of land is legitimate and for the benefit of the economy. The Aung San Suu Kyi-led National League for Democracy party campaigned on land issues and promised, in its 2015 election manifesto, to return “illegally lost land.” Instead, there are signs that more land has been confiscated. Human rights campaigners have criticized the lack of information provided to the public about the VFV law, the extremely limited opportunities for appeal and the dearth of opportunities for compensation if land is confiscated. They also fear that the policy will undermine cease-fire agreements between various regional armies already teetering on a precipice – which could further destabilize the situation for Myanmar’s 600,000 IDPs. Disputes over lucrative natural resources such as jade and gold have sparked civil wars in regions such as northern Kachin state, forcing many to flee. The Myanmar Department of Agriculture, which is responsible for implementing the VFV law, did not respond to requests for comment. According to international land research charity GRET, at least three-quarters of VFV land is located in Myanmar’s ethnically diverse states, stemming from the government’s failure to recognize the traditional and informal documentation of land ownership often practiced by ethnic groups. Western Chin state has the highest proportion of VFV land in the country, at 48 percent of its landmass, closely followed by 43 percent in Kachin and 42 percent in Rakhine. The western Chin and Rakhine states have some of the highest concentrations of VFV land. Gum Sha Awng, a coordinator for the Metta Development Foundation, one of Myanmar’s largest NGOs, warns that the law could trigger displaced people to return to unsafe areas. “This could be a factor for IDPs to decide a premature return in order to safeguard their land, which will further create vulnerability for the IDPs,” he says. It is a question – whether to stay or go – that remains acutely in the minds of Myanmar’s displaced.